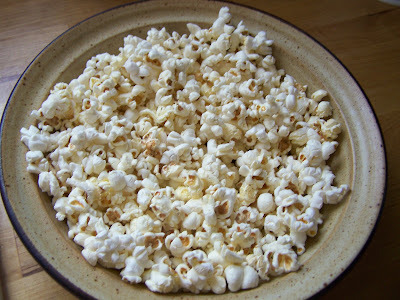 More friends and a blog: Popcorn! Here's a fun book to read if you are a popcorn fan. The boys and I read it and then, strangely enough, we started to feel a bit peckish...we needed a snack. It seemed only sensible to have popcorn. E decided to try his "Almanzo style" with some milk and a bit of sugar over it. 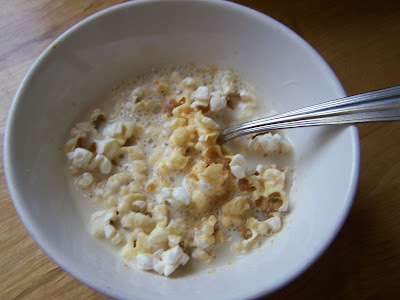 W said it tasted like "soggy popcorn" - surprise, surprise. ;-) E liked it. I had mine with butter and Herbamare (have I ever said how hooked I am on Herbamare?). For years we've eaten our popcorn with a seasoning mix that I mix up. We pop the corn and then drizzle it with some oil (usually olive or grapeseed with a bit of flax) and then sprinkle on the seasoning mix. The mix includes nutritional yeast (very yummy! ), oregano, chili powder and sea salt. Speaking of which I totally forgot to make it on the last movie night. I can't believe you didn't remind me - especially you, Samantha. ;-) I guess we need another movie night to make up for it. I've also simplified my popcorn to coconut oil and Herbamare. I can't say the milk and sugar popcorn tempt me, but good for E for trying something new :-) And now I really feel like some popcorn too! A book about popcorn? Well, I don't think I need any extra encouragement to make some. ;o) Although I think I'll skip "Almanzo style". E is such an entreprenuer in the kitchen! Popcorn is made daily in our household this winter. I use your tried and true seasoning, Heather. Yum! Mmmm! We use butter, yeast and Spike. I am addicted to Spike. I even have to buy the giant box these days. I should try coconut oil instead. I'm sure all that butter is totally solidifying my arteries. I don't remember Almanzo eating it with milk. I do remember them making it in the winter to eat with their cider. Funny, some of the Charlotte Mason groups I'm on diss the Little House series for being so racist and all, but all I can think of it how inspirational they were for me, what with all that food growing and preserving. I feel so thankful that I ever stumbled across them in the first place.